This Jute Duffle bag of sturdy construction is large enough to hold a substantial amount of stuffs and featured T/C lining and PU trimming to ensure strength and durability. The bag is natural jute coloured with apple green trimming and is decorated with lines of cotton drawstring. This eco friendly natural material duffle bag is a ideal gift for use as a Gym Bag / Kit Bag / Beach Bag / School Bag. Great for Adults and Kids. 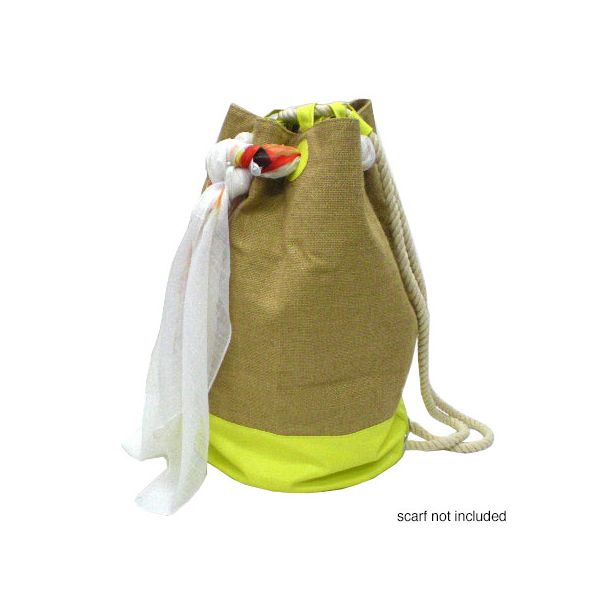 Made with natural Jute, Cotton drawstring closure, T/C lining and PU trimming. Jute fibre is a totally natural biodegradable and compostable fibre obtained from the jute plant and it is therefore an extremely attractive renewable resource for those who are at the forefront of the environmental movement and those who give top priority to environmental and ecological concerns. Jute, being a very strong natural fibre, is commonly used to produce rope, bags, sacks, hessian cloth, floor coverings, and carpet or linoleum backing. The natural qualities and biodegradability of jute are evidenced by the use of this fibre to produce planter bags so that plants can be planted in the soil while they are still in the bag permitting no root disturbance and quick growth as the planter bag composts into the soil structure. This allows young trees to be planted directly into the soil while still in their containers with no setback due to transplanting. The biodegradability of jute also permits it to be used for land restoration with biodegradable jute cloth being used to prevent erosion occurring while natural vegetation becomes established. Given the strength, durability, and biodegradable nature of jute, it is also ideally suited to the production of natural green bags. Jute Duffle bags are ideal for kit bags, school bags, perfect for the beach and great for adults and kids alike.